In 1954, the Canadian Pacific Railway purchased 173 stainless steel streamlined rail cars from the Budd Company of Philadelphia. To highlight the natural beauty along the route and to promote tourism, CPR decided that Canada’s national and provincial parks should be the inspiration for the interior design of “The Canadian” rail cars. The Royal Canadian Academy was asked to coordinate the selection of leading Canadian artists to paint murals for each of the 18 Vista Dome cars. The dome observation cars were considered the showpiece of the train. 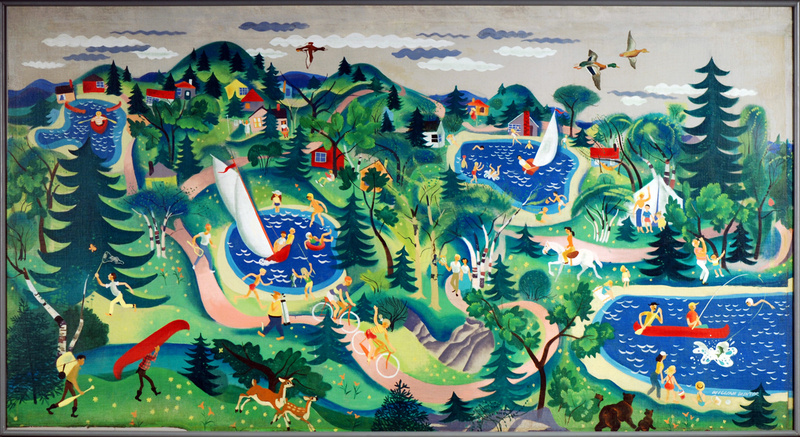 The murals are of parks from every province and three are by members of Canada’s Group of Seven – AY Jackson, AJ Casson, and Edwin Holgate. Each artist was paid $1,400 for the three paintings each produced. One was mounted to the bulkhead, another on the adjacent window wall, and a third on a map painting for the flat end wall. In order to undertake the mural project, a member of Canadian Pacific’s design team contacted the president of the Royal Canadian Academy of the Arts, who in turn contacted the artists. The artists submitted preliminary designs and the railway supplied the canvas cut to the appropriate size. Completed murals were glued to metal plates that were in turn riveted to the walls of the cars. An artist-decorated map accompanied the park murals. In 1986, Via Rail, the national passenger service that took over Canadian Pacific and Canadian National passenger routes, had the murals removed and restored. For the prior 25 years they had been subjected to cigarette smoke and abrasion. A cross-country exhibition was organized of the restored murals. Seventeen of the murals are now a part of the Canada Science and Technology Museum’s collection.